Saron Soeun was born in Siem Reap in 1976, during the Khmer Rouge regime. In 1979, after Vietnamese troops overthrew the Khmer Rouge, Saron's family fled to the Thai border where they lived in UN refugee camps during the reconstruction of the country. The refugee camp, with a population of 300,000 people, provided Saron with an education, allowing him to complete his High School diploma, earn a Human Rights Studies Certificate, and learn to speak English. In 1993 all the refugees were repatriated back to their villages/homeland. 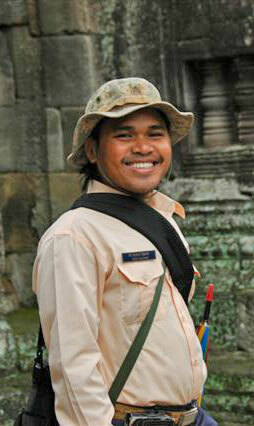 Upon returning to Siem Reap, Saron started studying for the Tour Guide Certificate. In the meantime, he worked as an English and Thai teacher; the Manager of the Angkor Youth Language Group; a hotel receptionist; and a Supervisor and Interpreter for the Gecko Environment Centre with the FAOUN project (Food and Agriculture Organization of United Nations). Saron continues to support the Centre, which is working to promote environmental awareness to the local people in floating villages and encourage the preservation of the fragile Tonle Sap ecosystem. Saron Soeun started working as a Tour Guide through the Siem Reap Provincial Department of Tourism in 1998. In 2006, Saron completed a two-year Associate degree in Business Management and Human Resource Management from a private university in Siem Reap, and earned a Bachelor of Business Administration in 2012. Saron graduated from the University of South East Asia (ASEA) in 2016 with a Masters of Business Administration, a huge accomplishment for him. Saron has shown incredible courage and determination in his struggle to overcome the hardships of living through the atrocities that were committed during Cambodia's history. He serves as a role model for his peers, provides hope and encouragement for others, and strives to instill the importance of education in his young family members. Come meet Saron, and be touched by the magic of this remarkable man's spirit.